What happens when I find things in the pantry I forget I had? I start skimming through Pinterest so I can make it a fun consumable and get it out of the pantry. Today’s adventure was with a can of pumpkin puree. In the fall I always have a can on hand and I won’t lie I was surprised when I found a can today. 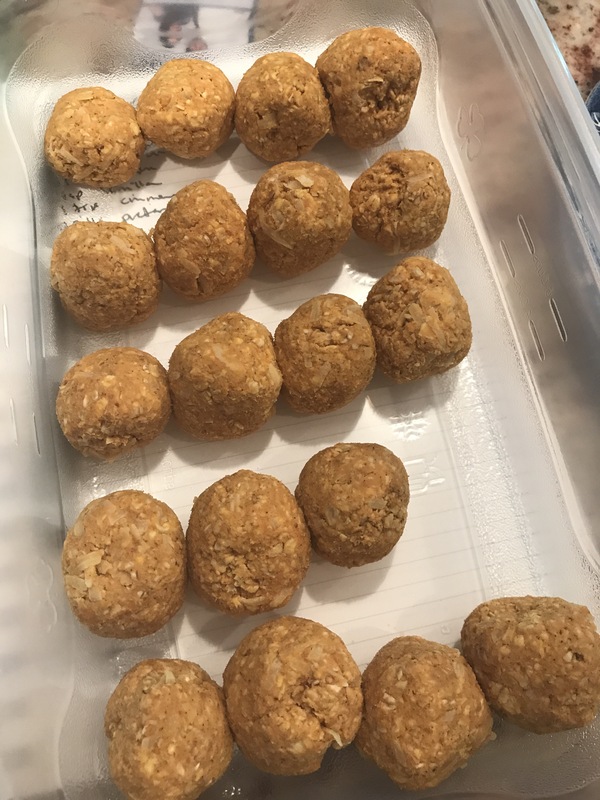 After going through some pins, I got an idea of the basis for a protein bite or protein ball, let’s be real though, 5g of protein doesn’t make something a protein snack. 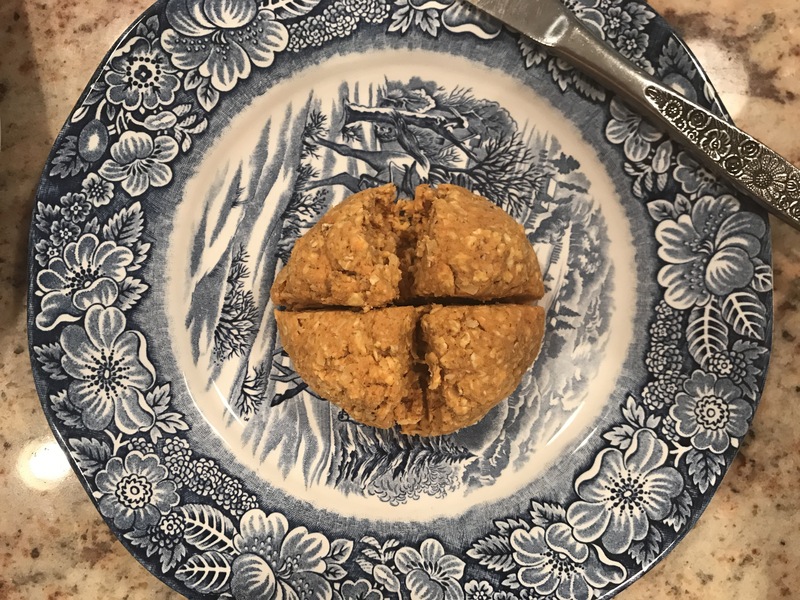 It does, however, support the well rounded nutrition in a snack, but I just can’t call it a protein ball. So with a can of pumpkin, some protein and a canister of oats I made some magic in the kitchen. In a medium mixing bowl, weigh out your oats. In the same bowl, weigh out your canned pumpkin. I added pumpkin a little at a time until the oats were sticking together. Mix in Splenda, cinnamon and vanilla extract. I added cinnamon a little at a time until I got the taste I wanted. At this point it tastes like an unsweetened pumpkin pie mix. Add in protein powder. 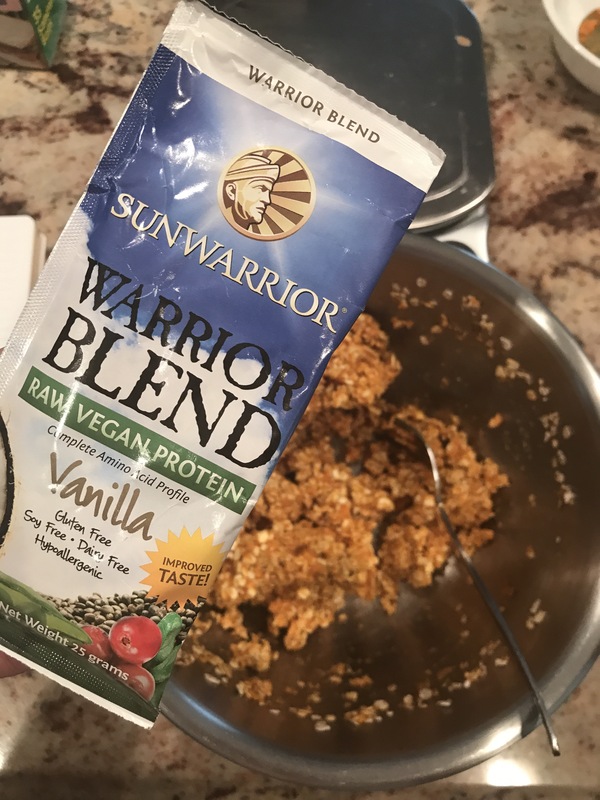 As I’m using up the pantry, I used a sample of vegan protein powder. You can use any protein powder. A basic flavor may be best like cinnamon roll, vanilla or snickerdoodle. I don’t think there would be an issue using whey, casein or a blend. *If you find that the casein or blend protein makes the mix hard to combine, add a tablespoon or water or two. Using your hands, mix in coconut flakes. When thoroughly combined roll into a ball and divide into your preferred servings. I wanted to keep the macros under 30g of carbohydrates per serving, so I made 5 equal larger portions. After weighing out the total serving fell free to make into small pieces. 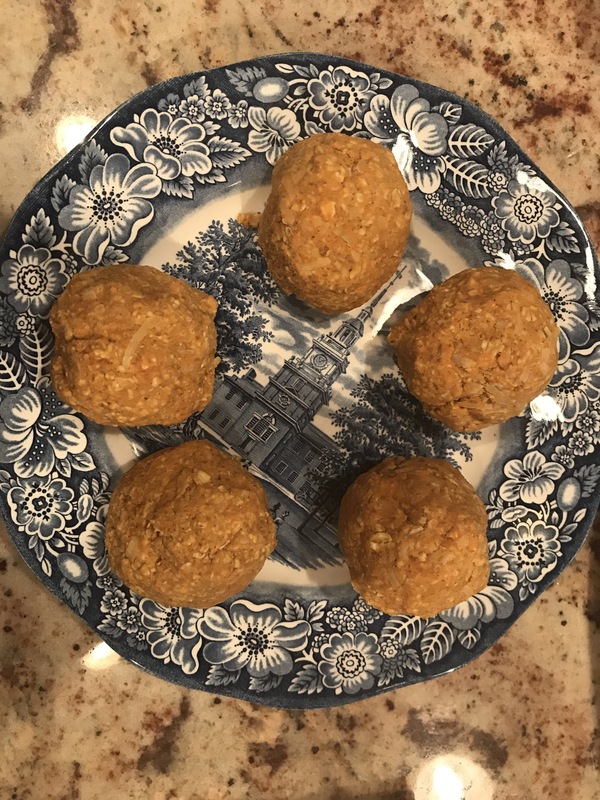 Each larger portion made 4 pumpkin and oat bites. Chill to keep fresh. Because these are a no bake, minimally additive food, please keep in mine that they may mold if kept too long. Of course before I could chill the container, JP felt the need to take one to try – a row of 4 was a serving. 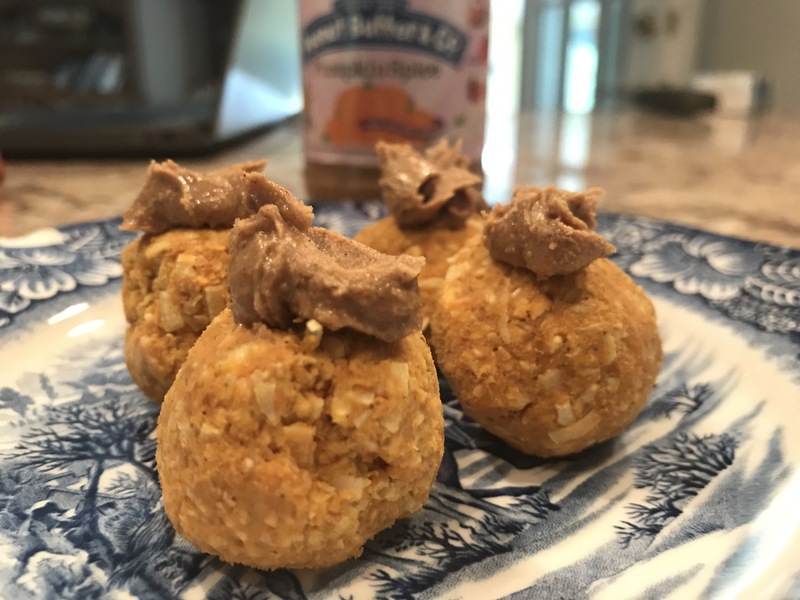 I put pumpkin spice peanut butter on mine, but you could have them plain or with a different nut butter. JP and I agreed they tastes like an unsweetened version of pumpkin pie. Cinnamon and vanilla was subtle, but tasty.